Welcome to one of my favorite childhood Christmas memories! Chocolate Peanut Butter Sandwich Cookies. These cookies have it all going on at once. Chocolate, creamy peanut butter, and crunchy buttery salty crackers. 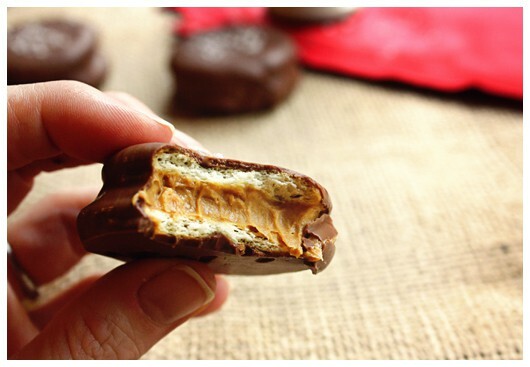 Very simply put, they’re an awesome homemade candy bar! 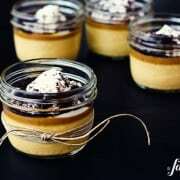 I know there are many variations to this recipe. 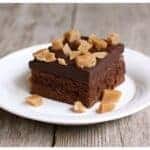 My friend Robyn at Add a Pinch stirs a little honey into the peanut butter layer, something I will definitely try next time. Others add Christmasy sprinkles or drizzles of colored candy coating. And some use expensive top-notch chocolate, shunning the chocolate bark used in the recipe of my childhood. While I’m known to tweak almost every recipe that crosses my counter top, I just couldn’t make these cookies with anything but chocolate bark. It’s about nostalgia. Howeverrrrrrr…I did experiment with adding a sprinkling of sea salt this time around, an ingredient unfamiliar to the cookies I made as a kid. It’s just a little something to up the salt quantity and please my grown-up taste buds. So that addition would make this a 4 ingredient recipe. I only salted half the batch, as I wasn’t sure what the rest of my family would prefer. Turns out, both versions disappeared at about the same rate. FAST!!! If you are in a hurry, lay some wax paper on two baking sheets. This will allow you to place the chocolate dipped cookies in the refrigerator for a quick set. If you have a little more time, simply lay some wax paper on the counter and allow the cookies to set up there, which really only takes about 20 minutes. Place a 1/2 tablespoon of peanut butter into the center of half the crackers. No need to spread the peanut butter. Place the cracker with peanut butter on the counter and center another cracker on top. With one finger at the center of the top cracker, gently press the cracker down a bit. This will spread the peanut butter out in between the two crackers. Repeat until you have 50 sandwich cookies made. In a medium sized bowl, melt the chocolate bark in the microwave (or use a double boiler on the stove top) on a low setting, stirring regularly. Take care to not let it scorch. When it is mostly melted, with just a few small lumps, stir the chocolate bark until it is completely smooth. Let it sit for a minute or so to cool just slightly. Then drop a sandwich cookie into the chocolate. Using a fork, quickly dunk the cookie to completely cover it with chocolate. Lift the cookie out with the fork and tap the fork handle lightly on the side of the bowl to force excess chocolate down through the fork’s tines. Bring the fork outward, dragging the bottom of the tines along the rim of the bowl, letting any other excess chocolate drip down the inside of the bowl. 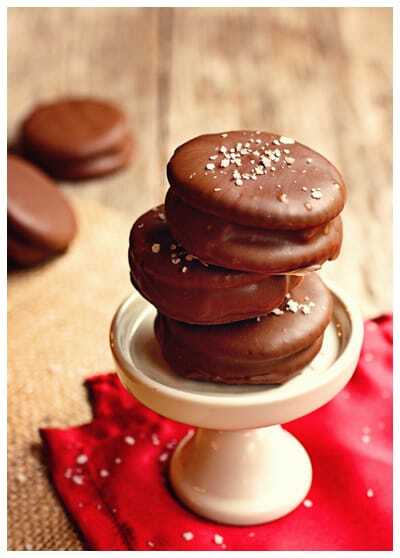 Place chocolate dipped cookie on the wax paper. Repeat until all cookies are dipped. If the chocolate becomes thick and difficult to work with, simply warm it up a bit in the microwave. If you wish to top the cookies with sea salt or sprinkles, be sure to sprinkle the cookies before the chocolate bark sets up. These freeze really well. Keep layers separated with wax paper. Can not thank you enough for this recipe!! Ritz crackers should be giving you a kick back from all the crackers I bought over the holiday. My family loved these. I wrapped mine in festive green foil and my kids/grandkids/sisters/brothers/mother/husband all thought I bought them. I decided to kick it up tad Christmas Eve ( nothing like cooking right up to the time you are walking out the door). I used Club crackers, made them triple layered and dipped them in white candy coating and added Christmas sprinkles on top. WONDERFUL!!! Thank you again!! These are ridiculously good! Did you know that peanut butter and chocolate are my favorite??? Can you say Merry Christmas? My family makes a couple hundred of these for our annual cookie bake every Christmas. These are by far the most popular cookie though my sister-in-law always says, “But these aren’t a cookie!” Ours are a little different in that we spread one cracker with the pb and the other cracker with marshmallow fluff before sandwiching them together. Wow, that’s alotta sandwich cookies! I LOVE the idea of marshmallow fluff…will def be giving that a try, thank you!! love these! we make them every year at christmas time. my great grandfather found the recipe on a box of ritz years ago and he’s been making them ever since. until this past year…in which he passed down the coveted “cookie dipping fork” to me and my sister. now (97 years old) he just enjoys eating the ones we make for him and our great grandmother! Thanks, Chelsea. I’ve never heard of this originating from the Ritz box – awesome to know! And I love that you have a coveted cookie dipping fork – AND a great grandpa who is 97 & is still enjoying them. WOW!! 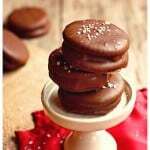 I made these cookies when I was little too but we use the vanilla bark but I love the chocolate ones too! 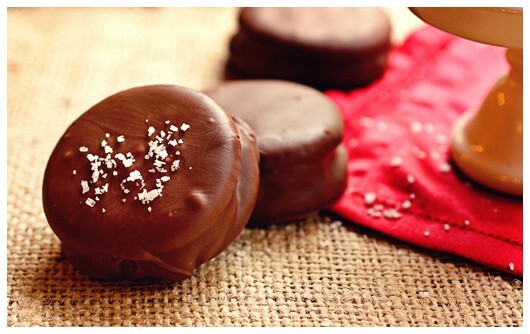 I haven’t made them that way, but I’m sure my family would love those, too – they love anything dipped in vanilla bark! Thank you is all I can say! This blog post saved me from throwing everything away. I don’t do desserts well, and I figured this would be easy..until…the chocolate. I hate dipping and melting chocolate, hate hate hate, and I was using spoons. Then I was getting all crazy and came to foodgawer and saw your post and your detailed instructions on using the fork and tapping it on the bowl is what saved me. Simple things like this is what makes or breaks someone like me LOL. THank you again!! So glad I could help, Dan. Enjoy!! For something so simple I have to admit that these look pretty fancy! I bet they’d make a great holiday gift! Wow these look good!! I love that they are no bake too! Perfect! Or at least a “Midwest” sort of recipe, as I grew up in SD. But I’ll eat them in any state, for sure!! Nice to hear from you, Julie! My grandma used to make these too…lol….from Iowa! 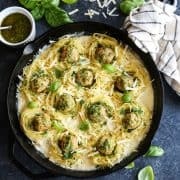 These look so delicious and way too easy! Saw this posted on Tasty Kitchen. Very nice blog! So nice to hear from you, Tricia – thanks!! Oh my goodness, these are just the best things ever!! I could not stop eating them. love love LOVE these… one of my favorites!! Yum! We make these with Wheat Thins sometimes, too. They’re so easy and so good. Now that’s a version I haven’t heard of – we love Wheat Thins, too – will have to try that out! Thanks, Shaina! Wow these look immense! I’m a big big fan of peanut butter although I have to ration it as if I could I’d eat it every day and get really fat! These sound SO delicious. What a PERFECT Christmas treat! I stir in a little powdered sugar to the peanut butter, just to help ‘set it.’ But I’m guessing that’s because of the type of pb I use… honey, or nothing at all, I freaking love these little things! Guess I need to try the powdered sugar bit, too – you’re the second person who’s said that! Nice to hear from you again, Julia! Thank you! I’ve always wanted to make these cookies, but never took the time to figure out how they’re made. 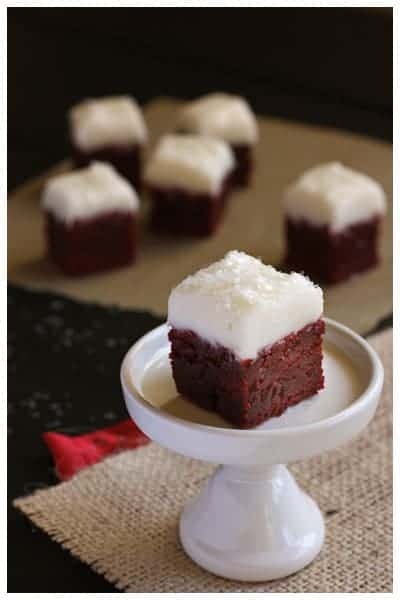 these look delicious and I’m definitely going to make this this Christmas season! You’re welcome, Lisa – enjoy!! I forgot all about these! These are so yummy and I made a batch right away after reading your post. I always sweeten up the peanut butter by adding confectioners sugar. It also firms it up a bit. Another interesting variation – I’ll be sure to try that one out, thanks! I love these cookies and the chocolate/peanut butter combination. Thanks for simplifying the process for us! Couldn’t be much simpler!! :) Nice to hear from you again, Katie. My husband does not have a large sweet tooth but he does love peanut butter. I’m betting he would love these with your updated version that contains a little bit of the sea salt. Great looking cookie…your Mom’s recipe box certainly does contain some delightful treasures. Love the idea of the sea salt. Want to give that a try this year. 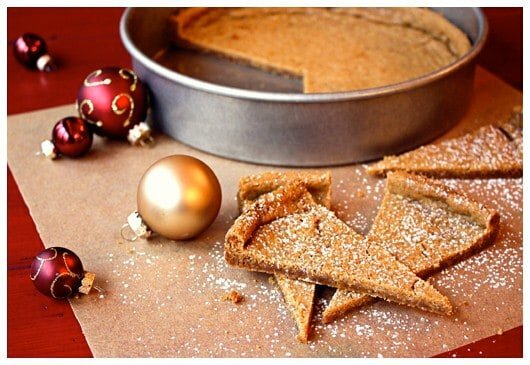 Always a hit during the holidays! Love these little cookies! What a fun, easy recipe! I love it! I am co-hosting the #cookielove blog hop on my site all month long and I think these would be a perfect addition if you’d like to link them. They are great! Thank you, Laura – Great to hear from you!